There's been a recent revival of activism online regarding Net Neutrality. Net Neutrality is the policy that was coined some years ago stating that internet service providers (ISPs) should not give priority to certain types of connections. To give a brief example of how this works, imagine an ISP has their own video streaming service that goes over the internet. In order to push people towards their own streaming service they could artificially degrade the connection quality to competitors such as Netflix or YouTube. Right now this is largely an American issue but the rest of us should also be concerned as it could happen in our own countries. Back in February 2015 the FCC (Federal Communications Commission) voted and mandated that broadband carriers be classed under Title II of the Communications Act of 1934. This effectively put ISPs in the same position as a telephone line carrier meaning that regardless of what was being transmitted the price for transmission wasn't to change. If you want to read the full 2015 ruling you can find it here. Fast forward to 2017 and with a new administration in charge, the net neutrality debate has come up again. A vote is scheduled for December 14 to determine if the FCC will repeal the current policies. With the change in administration this past January the vote is expected to pass due to party lines. The big internet companies such as Google, Apple, Microsoft, and Facebook are all in favour of keeping the status quo regarding net neutrality. It's hard to find some internet based company that wants these rules repealed. Coupled with that almost every major internet community also wants to see the current rule set stay in place. With that being said, let's have a look at what could be possible without net neutrality. 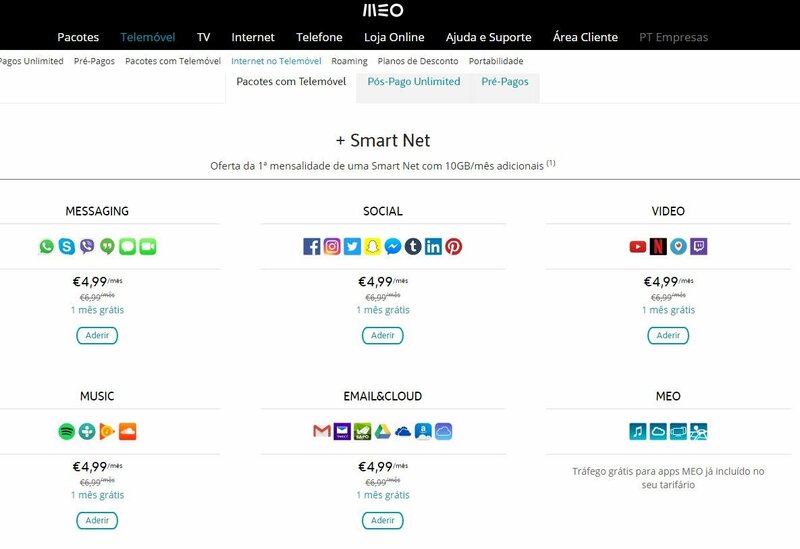 There's been an image making the rounds on the internet of an ISPs plan offerings from Portugal. You effectively start off with a plan at €4.99 per month and you need to pay an additional €4.99 for different kinds of websites that you want to access. One basket is messaging, another social, video, email, and music and cloud. No one wants to have to pay extra to use YouTube or Spotify if they're on a basic internet plan, that's just plain stupid. The internet existed for 20 years prior to having official net neutrality regulations in the United States with the odd anti-trust lawsuit. This doesn't mean that we can or should go back to the pre-2015 standard. There needs to be some form of legal framework that protects consumers while still fostering innovation and investment. We are fortunate to have tech giants such as Google, Facebook, and Amazon on our side amongst others, for now. The public position of these companies is that net neutrality is good and they're on the side of their users. The reality of this though is that these huge established mega internet companies do not need net neutrality anymore to be successful. Innovators, entrepreneurs, and the general public need net neutrality. I still maintain that for the time being the public does not need to worry about the motives of large internet companies who are supportive of net neutrality. Let's assume that the FCC does submit to pressure and keep the existing net neutrality rules in place, great, right? For now maybe, but there are potential issues that could crop up in the next few years. Google, Facebook, and Amazon are some of the largest corporations out there that use the internet for their profit margins. Google holds massive power in the area of search and determining what you want to know before you know you need it. Facebook has a massive edge in connecting people on the internet and knowing what these people want to engage with. Meanwhile, Amazon is working on decreasing the amount of friction it takes to purchase almost anything online with its mobile apps and Alexa based devices. The point being, we have three massive companies who currently hold massive monopolies that wouldn't be allowed elsewhere. With the ISPs situated attention will turn to those who use the internet, mainly the internet giants outlined above. It's possible though not guaranteed that Google, Facebook, and Amazon will continue to silo their services and act as extreme gateways to the internet. Google has accelerated mobile professing (AMP) which it uses to serve the internet through its lens. Facebook lets you communicate with your friends over a proprietary protocol and is also angling for news agencies to start posting to Facebook exclusively. Meanwhile, Amazon will have so many avenues into your life that it will just become the convenient way to purchase anything you need, it already has for many people. This potentiality was outlined in an article by André Staltz back in October entitled, The Web Began Dying in 2014, Here's How. It's an interesting read and goes on to show what could happen with or without net neutrality. Where do we go now? The current regime of big internet corporations will be fine if net neutrality goes away. They'll also be fine with net neutrality as they are slowly controlling more and more of the internet. The answer needs to be a model that fosters competition between internet giants, enables small internet business to succeed in a space dominated by giants, ensures a free and open internet for all (i.e. censorship), and protects consumers. Google, Apple, Microsoft, Facebook, and Amazon are some of the largest lobbyists (meaning they pay money to have the ear of lawmakers) in the United States and as long as their models of soft locking users into their ecosystems aren't challenged we won't see meaningful pro-net neutrality action from any of them. On the surface they all support net neutrality but if they wanted to, they could put monetary pressure on the elected officials and the FCC to keep the current regulatory rule set in place.